Two years ago I sent Spouse to the store for some chicks and he came back with baby turkeys! He thought it would be a good idea to raise our own turkeys for meat. What would be the consequences of adding another animal type to our small farm? How would we process the turkeys when the time came? Would the kids be able to handle raising animals we would eat? Well, I guess it turned out well because we survived our first year of raising turkeys and elected to get even more this year. Here are a few of our turkey tales. Turkeys are really easy to care for – they need grain, water, a little shelter and a place to roam. If you keep them just throughout the summer, they really just need a place with some shade. They fit easily into a twice-a-day barn trip schedule. Many of the breeds you can buy for meat become too heavy to fly, so keeping them in a fence without a top works (like we do). As we discovered, some of the smaller, heritage breeds can and do like to fly. But unlike our chickens, they stick a lot closer to home. One of our turkeys liked to sit on top of the barn surveying her kingdom. 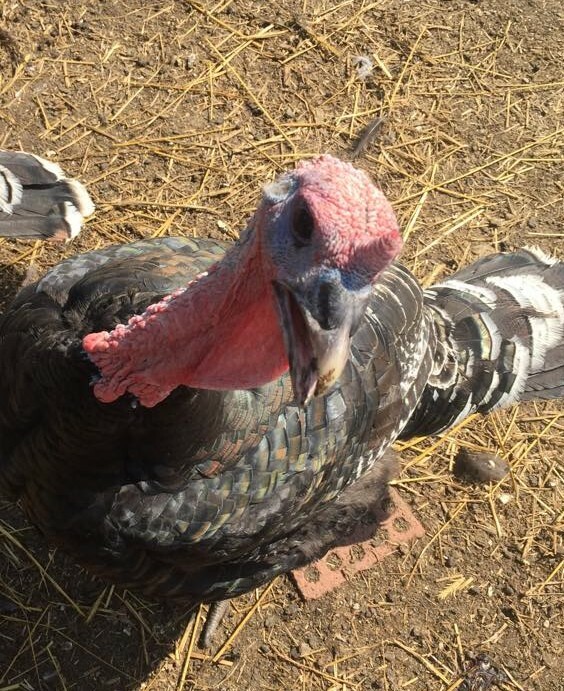 Although turkeys are easy to care for, there are a few things that we encountered. Turkeys can get a condition called wry neck. As you can imagine, it can look pretty bad when one of those long necks is twisted all around. Wry neck is a twisting of the neck that can occur for a variety of reasons. It is also called torticollis, which made me laugh because Number 2 had infant torticollis. There are a whole host of causes and treatments listed online, enough to delve into for another post. 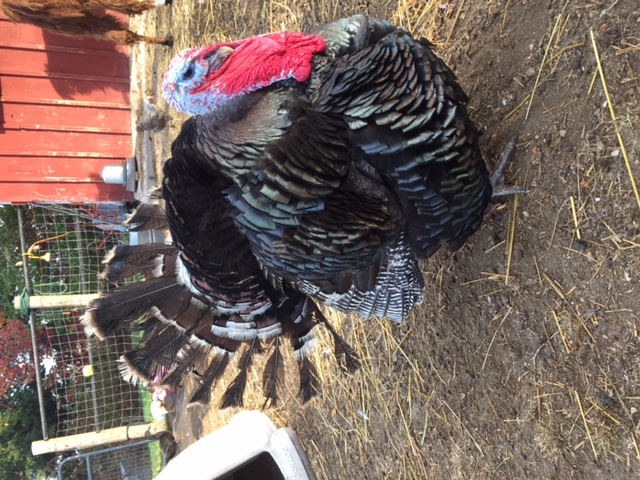 Turkeys (especially those that have been bred for meat) get big, really, really quickly. If you have them going in and out a regular-sized chicken door, they eventually won’t fit. Turkeys are extremely passive and we have never had a person-aggressive turkey. But because of their large size, they can give you a big wallop with their sizable wings or a long scratch with their claws. Something to note if you have kids that like to “play” with the turkeys. If you have toms and hens, mature toms can hurt the hens when they try to get romantic with them. We let our turkeys roam throughout the pasture and we give them produce scraps. However, by the time they are full-grown, they are eating grain at an alarming (and costly) rate. I can not imagine how commercial turkey producers sell turkey for $1.00/lb, it’s mind-boggling. I didn’t have a very high opinion of turkeys before we raised them. I thought they were kind of stupid and did nothing much but sit around all day. I have to admit though, I enjoy having turkeys around. Turkeys make all sorts of interesting sounds – chirps, peeps, clucks – and don’t forget about the gobble! 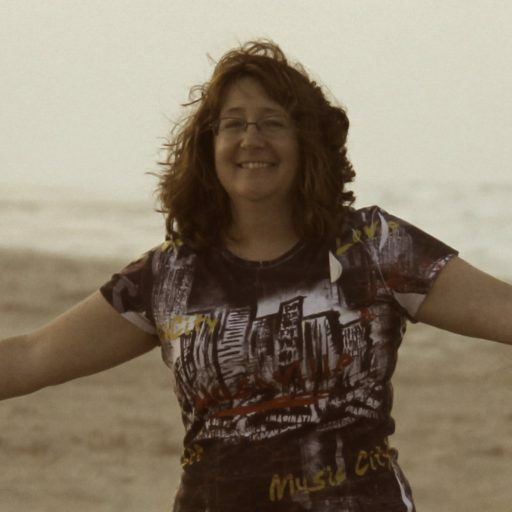 I can entertain myself for quite a while listening to them gobble (I know, simple minds). Turkeys also flatter you! 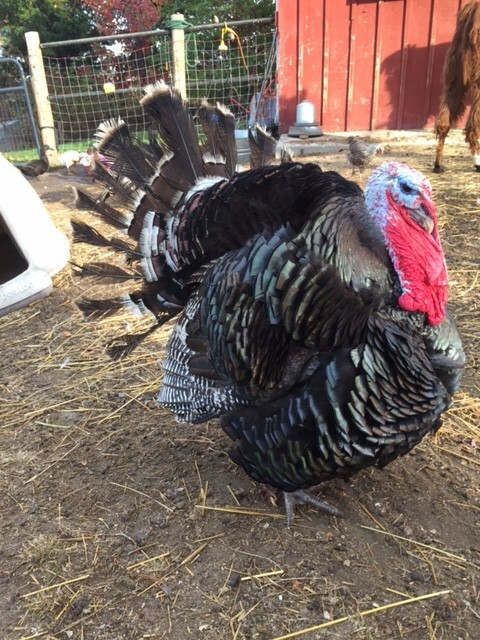 Whenever I visit them, my male turkeys strut their stuff for me. They parade back and forth shaking their feathers while amorously looking me in the eye. This poor guy doesn’t realize that he still needs to grow in half of his tail feathers. And this year our female turkeys laid eggs! The eggs are beautiful, large and speckled. Although they don’t taste as good as duck eggs, they are still delicious. They can be a bit tricky with their eggs though. We had a hen hiding eggs down in our pasture. 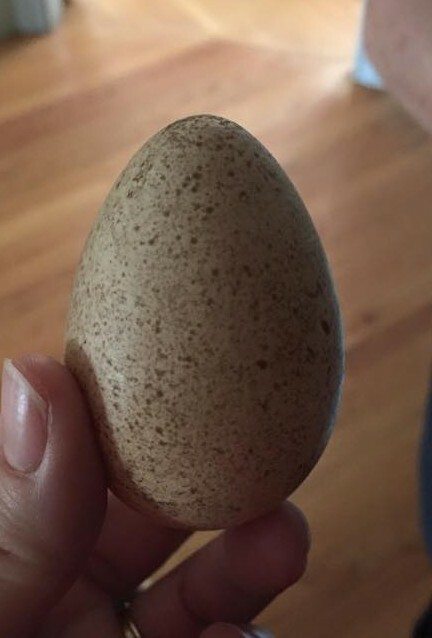 One of our first turkey eggs. And the big question – did we process our turkeys? Yes, yes we did. The first year we searched high and low for a place to bring our turkeys to for processing (think clandestine conversations with the deli guy at the grocery store). Although there are options for bigger turkey farms (including traveling processing units), they are not cost-effective for backyard turkey growers. Spouse finally got a lead on guy – it turns out a lot of people he works with have small farms and there is a network out there. So in the wee hours of a cold morning, he came to our farm and taught me how to process our turkeys. And this year, Spouse and I did it ourselves. 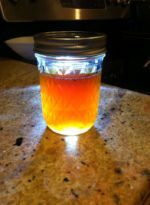 If you want to know the nitty-gritty details, I’ll post them on our farm site: 5maplesfarm.com For me, it wasn’t hard. My dad had raised chickens for meat when I was little. I have no delusions about where my packaged store meat comes from. As to the kids? They dealt with it really well. We let them watch the processing as much as they wanted. They knew from the beginning that we were going to eat the turkeys. We reminded them often and we didn’t name them.